Future Generali India Life Insurance has partnered with Manipal Global Education Services (MaGE) for a customised Life Insurance Training Program for its future employees. The program will be delivered at the Manipal Global Academy of BFSI Campus in Bangalore. Manipal Global’s Life Insurance Training Program is a customised one-year full-time training program comprising of four months on-campus residential training and two months of internship followed by six months of on-the-job training at a Future Generali Life Insurance Company branch. The training program is designed to equip learners with the necessary domain knowledge in Life Insurance and enhance their business development skills. Ravi Panchanadan, Chief Operating Officer, Manipal Global Education Services (MaGE) said, “ We are delighted to partner with Future Generali Life Insurance Company. Providing learners with high quality training is our prime focus. 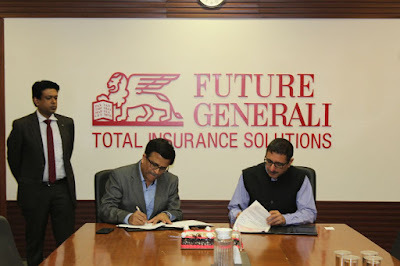 This partnership with Future Generali Life Insurance reflects our commitment towards capability building in the BFSI industry where we have been helping organizations build and manage a future-ready talent pool. We are confident that Future Generali Life Insurance training program will establish benchmark in talent management for the Insurance industry". On the successful completion, students will be awarded a Post-graduate Diploma in Life Insurance and will be offered an employment at Future Generali Life Insurance Company. The aim of the Life Insurance Training Program is to mould officers of high calibre in the field of life insurance and create a productive workforce. The first part of the Life Insurance Training Program will commence in February 2018. “Speaking on the occasion, Munish Sharda, CEO Future Generali India Life Insurance Company Limited said “As the Insurance sector is picking up pace in India, there is an increased demand for talent at all levels. At Future Generali, we want to give our customers a differentiated experience and therefore, focus significantly on training and development of our employees. Our partnership with Manipal Global is a step in this direction where we aim to induct talent at an early stage and provide them necessary skills and knowledge to be able to deliver a unique experience for our customers. The curriculum is designed in such a way that it will help build a pipeline of specialists with sharp problem solving expertise thereby enabling us to create a pool of well trained professionals in the organisation”.